Each year our annual scholar art show welcomes a new guest artist – Someone from our community who our art team invites to bring a new artistic perspective to our opening reception and scholar art show. For this year’s upcoming For Art’s Sake Scholar Art Show & Artisan Fair we are pleased to welcome guest artist Adam Ferbert. Adam is a Rhode Island resident and Cranston middle school teacher who used artistic expression as a way to explore his own identity and now teaches art to encourage students to do the same for themselves. Adam’s artistic journey started when he was a small child. His father was a carpenter and so his childhood home was often in the midst of repairs. On unfinished surfaces throughout his home, he was allowed to draw. He thinks back on these drawings as his first attempts at self-portraits, but certainly not his last. Years later, Adam had a defining moment with self-portraits. When he was a young adolescent an English class assignment given to his class invited students to draft a personalized poem and accompany it with a symbolic self-portrait. I remember that I practiced for days, trying to unlock the secret to making a drawing appear life-like and how to make the features recognizable as my own. My portrait was finished off with vivid color to exemplify my personality and different shapes to illustrate the symbolic complexity of my ideas and opinions. Adam found that explaining the meaning behind his self-portrait to his peers was exhilarating. From then on self-portraits became a way for him to gain confidence in his artistic skill and connect socially with others. Evolving as an artist into his late teen years, creating self-portraits became a method of journaling for him. As an adult, it continues to be both a means of self-expression as well as a way to explore new media. We’re excited to have Adam join us this year and we invite you to meet him yourself by attending our upcoming For Art’s Sake Scholar Art Show & Artisan Fair! This event is free and open to the public. 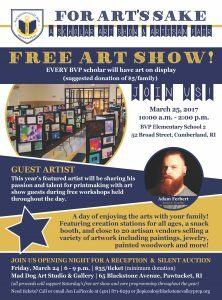 Please join us on Saturday, March 25th at Elementary School 2 (52 Broad Street, Cumberland) for a day featuring BVP scholar artwork and an artisan fair where local vendors will sell a variety of artwork. Free workshops will be offered throughout the day including sessions with Adam where he will share his passion and talent for printmaking. This event is made possible with the proceeds raised at our opening reception, held the evening before the scholar art show. This year’s opening reception will be on Friday, March 24th at Mad Dog Art Studio in Pawtucket from 6-9 p.m. Tickets are on sale for a minimum donation of $35/each. Click here to reserve your tickets. We hope to see you there!